Grim Reaper frontman Steve Grimmett has been stuck in a hospital in Ecuador since January 14, 2017 and has also lost a good portion of his right leg during that time due to a very serious infection that was spreading rapidly. Although the singer had travel health insurance, his insurance carrier has apparently refused to cover the medical bills meaning that Grimmett is out of pocket thousands of dollars which continue to mount the longer he is in Ecuador. A crowd funding campaign was started to assist Grimmett in that regard. As can be expected with the metal community, it has rallied around the ailing singer. 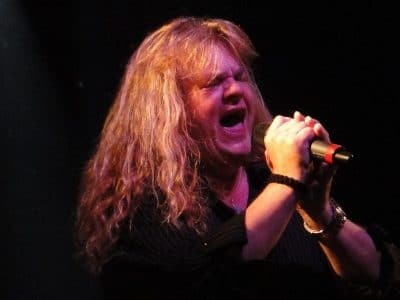 Jimmy Kay from The Metal Voice streamed an announcement earlier today from Steve Grimmett and his wife Millie on how the singer is doing and how the metal community is rallying to help him raise funds to cover the ever increasing medical bills. Jimmy Kay from Canada’s The Metal Voice streamed live into the hospital in Ecuador where Steve Grimmett (Grim Reaper singer) and wife Millie Grimmett updated their fans on Steve‘s medical condition. Also joining the show Tony Dolan (Venom Inc) and former singer of Anthrax, Neil Turbin. Two announcements were made during the show, the first a fundraising show in their hometown of Swindon, England on April 1 organized by Brian Keene at the Riff’s Bar. The second announcement was well known metal artists coming together to re-record a Grim Reaper song to help raise funds towards Steve Grimmett to cover medical and recovery costs. The project is spearheaded by Tony Dolan and aided by Neil Turbin (ex Anthrax) and Sy Keeler (Onslaught). The contribution artists include Gary Holt (Slayer, Exodus), Ripper Owens (ex Judas Priest), Doro Pesch, Lips (Anvil), Neil Turbin (Deathriders), Sy Keeler (Onslaught), Bobby Blitz (Overkill), Nick Bowcott (ex Grim Reaper), John Gallagher (Raven), Mantas (Venom) and more to be announced soon. The song will be produced by Chris Tsangarides (Judas Priest).